Buford Betty: What about BOB? I am an Amazon freak myself.... if Amazon doesn't have it, I don't need it! Very nice! My good friend has this stroller and loves it! 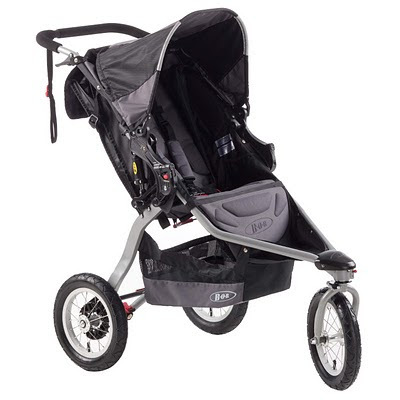 I definitely want to get a jogging stroller at some point, but Husband read something that said we should hold off until he's a year old (so his little body is better equiped to handled all the bouncing) so he doesn't even want us to have one in the house until then (so I won't be tempted, I suppose). Oh well, I told him he'll have to be willing to watch the little guy while I'm out trying to get my running back in gear! How exciting! Our Bob for our baby girl arrived yesterday-I am dying to get her in it. Oh, we got the Bob Revolution SE and used it for the first time today with our 13-day-old son! You are in for a treat! We love this stroller, and we live on Capitol Hill in DC, which has treacherous, bumpy, brick sidewalks, so we knew we would need a sturdy stroller. Make sure to buy the infant car seat adapter so you don't have to wait until your son is 3 months old to ride in the BOB. With the adapter, you can use the stroller right away. Enjoy it! Create a registry at Amazon anyway. You get 10% off most items left on the registry after the due date, or something like that. Definitey 10%.